Over the 50 years or so that electronics circuit designers have been working on semiconductor-based logic circuits, many designs have been developed for creating logic gates. Because each approach to designing logic circuits results in an entire family of logic circuits for the various types of gates (NOT, AND, OR, NAND, NOR, XOR, and XNOR), the different designs are often referred to as design families. RTL: Resistor-Transistor Logic, which uses resistors and bipolar transistors. DTL: Diode-Transistor Logic, which is similar to RTL but adds a diode to each input circuit. 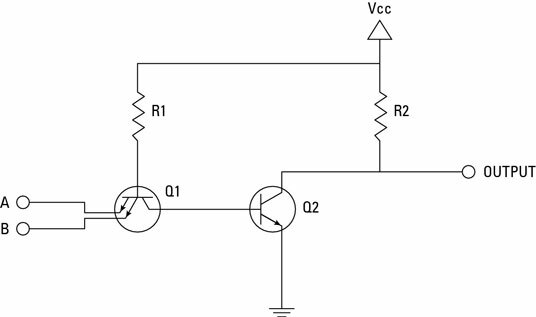 TTL: Transistor-Transistor Logic which uses two transistors, one configured to work as a switch and the other configured to work as an amplifier. The switching transistor is used in the input circuits, and the amplifier transistor is used in the output circuits. The amplifier allows the gate’s output to be connected to a larger number of inputs than RTL or DTL circuits. In a TTL circuit, the switching transistors are actually special transistors that have two or more emitters. Each input is connected to one of these emitters so that the separate inputs all control the same collector-emitter circuit. The switching transistor’s base is connected to the Vcc supply voltage, and the collector is connected to the base of the amplifying transistor. Although you can build TTL circuits by using individual transistors, ICs with TTL circuits are readily available. The most popular types of TTL ICs are designated by numbers in the form 74nn. In all, a few hundred types of 7400-series integrated circuits are available. Many of them provide advanced logic circuits that you aren’t likely to use for home electronics projects. CMOS: Complementary Metal-Oxide Semiconductor Logic, which refers to logic circuits built with a special type of transistor called a MOSFET. MOSFET stands for Metal Oxide Semiconductor Field Effect Transistor. The physics of how a MOSFET differs from a standard bipolar transistor aren’t all that important unless you want to become an IC designer. What is important is that MOSFETs use much less power, can switch states much faster, and are significantly smaller than bipolar transistors. These differences make MOSFETs ideal for modern integrated circuits, which often require millions of transistors on a single chip. Apart from drawing less power and operating faster than TTL circuits, CMOS circuits work much like TTL circuits. In fact, CMOS chips are designed to be interchangeable with comparable TTL chips. CMOS logic chips have a four-digit part number that begins with the number 4 and are often called 4000-series chips. As with the 7400 series of TTL logic chips, several hundred types of 4000-series chips are available. CMOS logic circuits are very sensitive to static electricity. Make sure that you discharge yourself properly by touching a grounded metal surface before you touch a CMOS chip. For maximum protection, wear an antistatic wrist band.